Photo Credit: Vermont Catholic/Cori Fugere Urban - Participants in a past year’s Rally for Life carry a sign to the Statehouse in Montpelier. “Killing innocent, vulnerable people is not a compassionate solution to any problem,” Carrie Handy writes in her column. Are you tired of bickering among Catholics over which political party truly cares about life? Have you lost count of social media postings that begin with, “Don’t call yourself pro-life if… .” It can sometimes seem like we’re more interested in defending our political affiliations than our faith. If Catholics agree on the sacredness of human life from conception until natural death, then what is all the debate about? It is at least partly rooted in conflicts over the role of public policy in our pluralistic society as we seek solutions to myriad problems related to poverty, medical costs, domestic violence, unwelcome pregnancies and so on. option” because of the shortage of resources. She shared the struggle her own family endured when her grandmother was sick for an extended period. Sadly, her story is echoed by thousands of families nationwide, and there are no easy answers. But I know this: Killing innocent, vulnerable people is not a compassionate solution to any problem. A maxim of Christianity is that, “One may not do evil that good may come from it.” Abortion and assisted suicide are intrinsically (or “always”) evil, and while they may be tempting short-term solutions to individual problems, they make very bad public policy. For example, where assisted suicide is legal, it has been shown to slow or even reverse progress in pain management and palliative care. resources to assist mothers in need and for children with disabilities have improved, emotional support for moving forward with a challenging pregnancy has plummeted. In Oregon, where assisted suicide has been legal for two decades, “fear of being a burden” is among the top reasons given when assisted suicide is sought. In short, legal abortion and assisted suicide effectively reduce choice. The preponderance of the evidence is that doing evil, even with noble motives, is not only deadly for your soul, it also makes bad public policy. 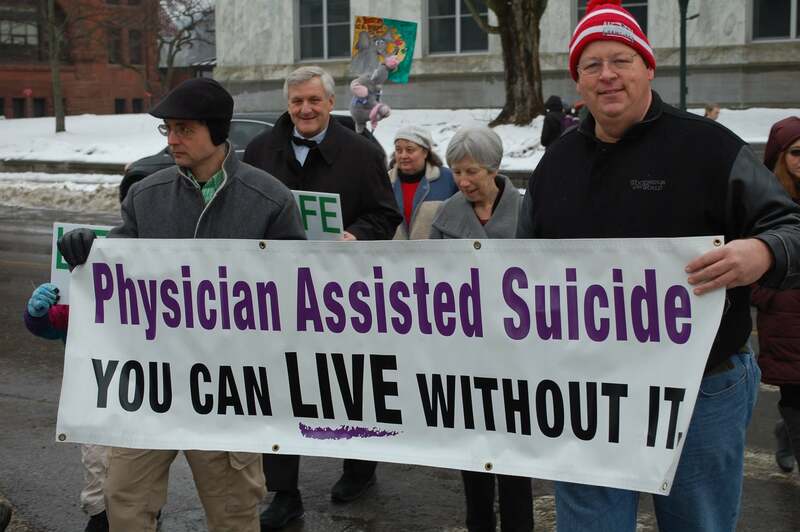 Tragically, Vermont allows both abortion and assisted suicide. Nevertheless, being legal doesn’t make it right, and our faith calls us to be witnesses to the truth even when it’s unpopular. An ongoing controversy involving the University of Vermont Medical Center offers an illustration. Last fall, the UVMMC Board of Trustees reversed its longstanding policy against performing elective abortions. Since then, the medical center has moved to expand its abortion services, an action that has unleashed a public outcry, upset many staff members and patients and even driven patients to other facilities, according to the Vermont Right to Life Committee, which has spearheaded an information campaign to raise awareness and ask questions. The hospital has a legal right to perform abortions, but should it? One may not do evil even for good motives. This is a moment in which all Catholics, irrespective of political leanings, can take a stand for life and join those asking the board to reconsider the new policy. Whether it’s speaking out publicly, pursuing other healthcare options that reflect our values or signing a petition, we all have a role to play. —Originally published in the Fall 2018 issue of Vermont Catholic magazine.